Marvin Joe Rutland, son of Joseph Edward Rutland and Bertha Ona Morse, married to Doris Runyan and buried in McBee Cemetery, Ovalo, Taylor County, Texas. Marvin Joe Rutland, 91, passed away September 21, 2013 in his home. A funeral service will be held on 10:30am Wednesday, September 25, 2013 at Lawn Church of Christ, directed by Fry~Bartlett Funeral Home, Tuscola. Burial will follow in McBee Cemetery. A visitation will be held from 6 to 8pm Tuesday, September 24, 2013 at the funeral home. 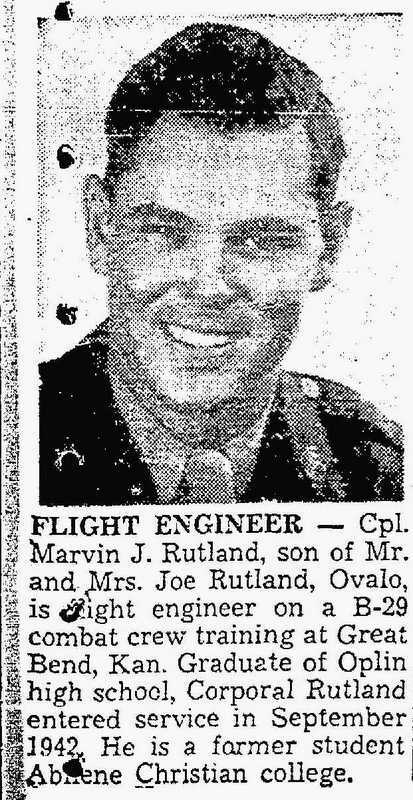 Marvin was born May 17th, 1922 to Joseph Edward and Bertha Ona (Morse) Rutland in Oplin. He graduated from Oplin High School in 1939. He attended Abilene Christian College before serving in the Army Air Force during World War II. He served from 1942 through 1946 as a flight engineer Tech Sergeant in Okinawa, Manila, the Phillipines, and Tinian, Marianas. He resumed his education at Abilene Christian College in 1946. Marvin met Doris Runyan while at Abilene Christian College and they were married on November 16, 1947 in McAlister, New Mexico. Marvin loved his wife of almost 66 years. She was his true love. He also loved his children, grandchildren, relatives, friends and church family. He farmed and ranched his entire life in Taylor and Callahan counties keeping the farm in continuous operation since 1908 as a legacy for his descendents. He received the Centennial Family Land Heritage award from the Texas State Legislature in 2010. He enjoyed the challenge of tilling the soil and working with cattle. He was a good and generous neighbor, sharing with those in need. His word was his true bond. Marvin attended the Oplin Church of Christ in his early years and later became a member of the Lawn Church of Christ where he was active as an elder for several years. Marvin was a member of the Texas Farm Bureau and served as president for many years. He also served on the Jim Ned School Board for 15 years. He is survived by his wife, Doris and his children: daughter, Janie Runyan and husband, Larry of Mansfield; son, Steve and wife, Marsha of Oplin; son, Gary and wife, Tik of Thailand, and daughter, Becky Peschell and husband, Sam, of North Richland Hills. They have 12 grandchildren and 9 great grandchildren. Preceding him in death, includes an infant brother, his daughter, Winona Gail, and his parents. The family requests in lieu of flowers, memorials to be sent to The Cherokee Home for Children, PO Box 295, Cherokee, TX 76832.